Honeysuckle Cottage is one of a series of modern properties on the west side of Hoxne Road and therefore in the parish of Denham, the parish boundary with Hoxne running down the road. The property lies in the centre of the former Denham Green (DEN 005), which ran for c.800m along the edge of Hoxne Road, and the rear boundary of the garden is marked by a substantial ditch and pond marking the former Green edge. The 1st Edition OS shows that the Green had been enclosed into a series of largely open plots, with one boundary corresponding to the modern northern edge of the garden. 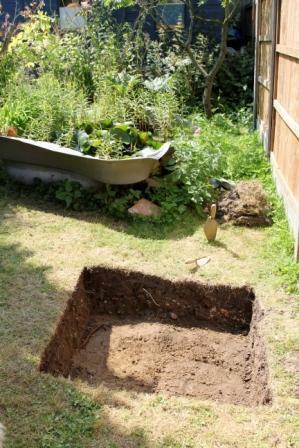 The test pit was placed in a grassed area adjacent to a fence marking the northern edge of the garden, c.50m from the road frontage. The fence is set within a slight linear depression running east to west, the remnant of a former ditch line, and the test pit was placed across a slight north facing slope. Removal of the 0.3m thick modern topsoil, Context 1, exposed the natural clay subsoil in the south-east quadrant of the test pit. The edge of the ditch was then visible running east to west through the centre of the test pit, cutting the clay subsoil and was infilled with a dark grey/brown clay/silt. A second possible feature, also with a dark grey/brown clay/silt fill, was identified in the south-west quadrant but was not excavated and its relationship with the ditch was unclear. The upper 0.1m of the ditch was removed, exposing the upper part of the moderate slope on its southern side, in spit 4 but finds may be mixed with the above topsoil. Fifteen fragments of medieval pottery were found, including the rim of a small jar dating to the 12th- early 13th centuries. 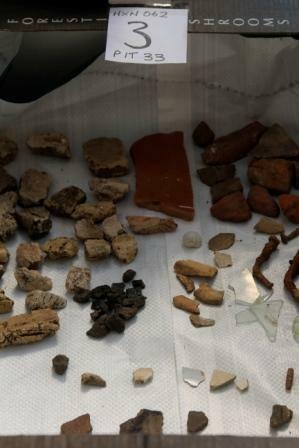 In addition three sherds of LMT were identified (15th-16th century), and GRE(16th-18th century), a sherd of IGBW (16th-18th century), a fragment of a Staffordshire slipware cup (L17th-18th century), and an abraded sherd of TGE (16th-18th century), together with much later pottery dating to the Victorian period and later. 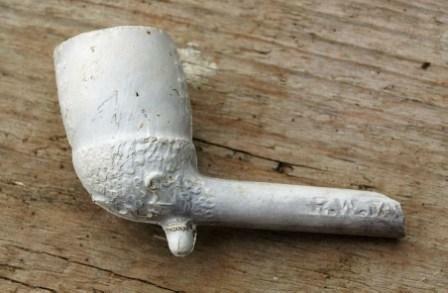 The bowl of a clay tobacco pipe moulded into an acorn, with a stem with a stamp on it dates to the 19th century. A fragment of a milk bottle and a copper button was identified, dating to the 20th century. The test pit clearly showed the cut of a ditch, presumably marking the boundary shown on the 1st Edition Ordnance Survey. As the pit lies in the centre of the former Denham Green this ditch is most likely to date to after its enclosure in the 18th/19th centuries, although it could possibly be an earlier drainage ditch across the Green, rather than a property boundary. The owners have previously excavated an earlier test pit (as part of a Time Team 'Big Dig' project) elsewhere along the ditch line, which also contained medieval finds material (Liz and Chris Brooks pers comm). Together these pits contain a surprising quantity of material from the 12th - 17th centuries considering their location in the centre of the Green and later use as a field, perhaps suggesting that Denham Green may have been a stronger focus for medieval settlement than is indicated by its size in the later post-medieval period.